This article submitted by Linda Stelling on 3/29/00. A resident at the Good Samaritan Care Center, Tillie Schmitz, 105, found she hadn't forgotten how to spin wool into yarn. All the memories came flooding back once she started pumping the pedal on the wheel last week. "My mother taught me how to spin," said Schmitz(pictured). "We had four sheep which provided us with all the wool we needed. We knitted socks, mittens, and caps from the wool and sold them in town for 50 cents a pair." "It was amazing to watch Tillie," said Marcia McCarney. McCarney learned to use a spinning wheel in 1975 while in college. She showed the residents how to card wool and spin the wool into yarn. The residents had watched a video about spinning the week before. 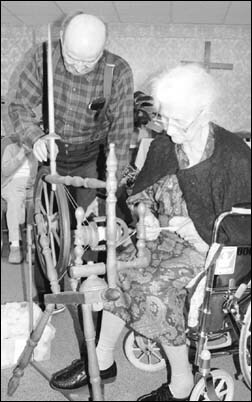 Mary Hukriede brought her grandmother's spinning wheel to work. The wool came from sheep owned by Mari Louis. Hukriede washed the wool and the residents at the Good Samaritan Care Center carded the wool, preparing it for spinning.